Emilia Romagna is the land of food: parmigiano cheese and prosciutto ham have helped the region gain international recognition, particularly as of late. Spend a year in Bologna like I have and you learn the best ways to eat and pair such delicacies. You will most likely find yourself diving nightly into aperitivi so full of meats and cheeses that you won’t have room for dinner. At a place called Osteria del Sole in the heart of Bologna, I fell in love with a type of wine native to the surrounding hills. I had honestly never heard of it before moving to Bologna from Rome in 2011. The wine was called Pignoletto, which comes in sparkling and still versions, and is the perfect companion (next to a Lambrusco) to an Italian aperitivo. During my year there I made it a mission to find a great Pignoletto that I could eventually introduce into the American market. This is where Donatella Agostoni and Fabio Bottonelli from Manaresi come in. They are the husband and wife team behind some of the best Pignolettos I’ve tasted in the Colli Bolognesi (a wine producing area surrounding the city of Bologna). 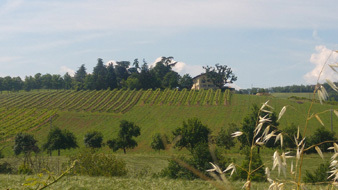 Most Pignoletto production happens southwest of the city in towns like Zola Predosa, where Manaresi is located. This area is known for sparkling wine production and also some of the finest expressions of Cabernet Sauvignon in all of Italy. 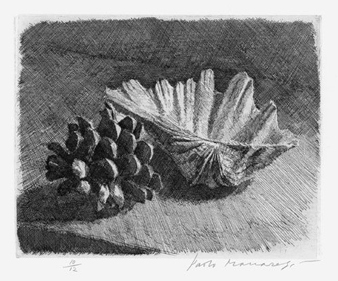 Manaresi is named after a famous artist Paolo Manaresi, whose works can be found in Bologna, particularly in the “Accademia delle Belle Arti” right downtown. Like most successful Italians, Manaresi owned a country house in the hills just outside of the city center where he spent his summers and a lot of his down time. 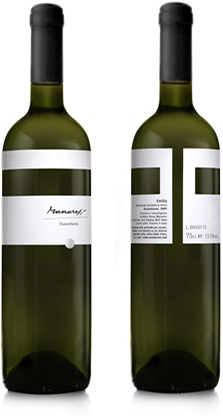 In the late 80s, Manaresi’s daughter bought adjacent land to her family’s property and from there, the long process of converting the land to vineyards started. 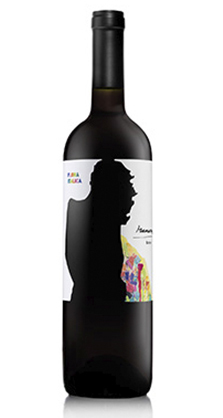 In 2009, they produced their first wines with labels inspired by the artist himself. On my first visit to “Bella Vista”, the hill on which the winery stands, it was easy to see why Donatella’s mother chose this site. With views as far as the Alps on a clear day and glimpses of Bologna, it seems unjust that we rarely hear anything about these beautiful hills. That is because they are so often overshadowed by nearby Tuscany. On my second trip to the winery, I came to talk business, but found myself embarking on a 10k walk with Fabio and a local guide. They were organizing routes for a bike tour through the countryside, which would include stops at multiple vineyards. This development was all in hopes of promoting these lovely hills and capitalizing on Bologna’s recent surge in tourism. With work clothes on and 90 plus degree heat and humidity, I struggled through it, all the while falling further in love with the Colli Bolognesi. In such unassuming hills so close to the city center, I didn’t believe it was possible to feel so far from civilization. I returned a hot mess in need of a refreshing glass of Pignoletto Frizzante. The winery sits on 8 hectares and the property (called Podere Bella Vista, or good view) truly lives up to its name. From the highest point of the property you can catch glimpses of Bologna. Looking in the other direction however you are met with the beauty and tranquility of the unknown and underappreciated Colli Bolognesi. Vines are relatively young with the oldest planted in 1988 and most planted in 2000. Fabio and Donatella continue to look to purchase small plots of land that surround the property, continuously planting new vines. I envision their capacity arriving at 40,000 – 50,000 bottles from the 30,000 or so they now produce. They have about 3,000 to 4,000 plants per hectare planted and they are very selective throughout the year practicing careful pruning and a green harvest. The winery is not organic certified but Fabio and Donatella are really careful to avoid the use of any chemicals and prune and harvest completely by hand. 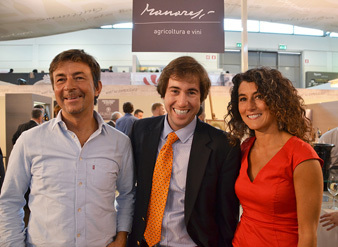 Manaresi has invested quite a lot in modern winemaking technology for the winery to help minimize the use of additives. The winery is temperature controlled, as are their stainless steel tanks. Manaresi maintained the cellar of the family home, which is a few hundred years old, which building a more modern cellar alongside it. What is even more memorable about the winery is the fact that Fabio and Donatella created a museum of sorts with Fabio Manaresi’s old painting’s lining the cellar alongside winemaking materials used by generations past linking the two worlds very nicely. In the end it is this link that one really feels when spending time at Manaresi. 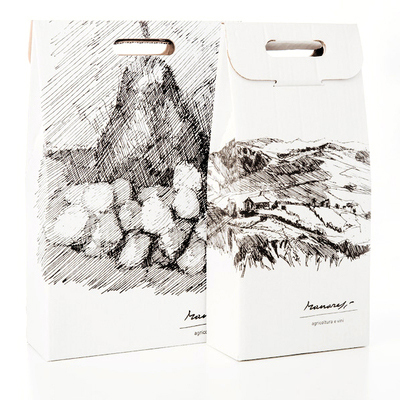 It can also be seen with their packaging from box to bottle. There is a real sense of pride for Donatella and a sense of determination as well. What is most impressive about this venture is Donatella’s clear understanding of the style of wine she wants to produce. 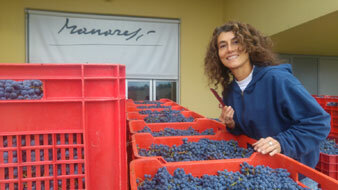 This is something that takes most winemakers time to develop but she has known since the word go. Intense aromas of pear and white flowers. This lightly sparkling wine has a tiny, consistent bubble that makes for a nicely refreshing wine. • Antipasti: prosciutto crudo, coppa, cheeses. • Flavorful pastas and meats. • Turkey stir fry with basmati rice. • Early harvest to maintain acidity, first and second fermentation in steel tanks before bottling (Charmat Method). Mint fused with banana. Also, intense aromas of pear and pineapple. 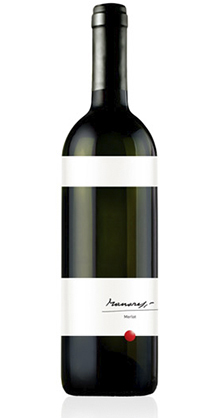 This aromatic varietal is harvested from 20 year old vines, the cru of the cru that is Manaresi, thus increasing the intensity of the wine. Savor and structure give this wine some staying power! 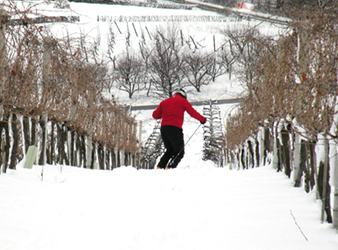 Look for a touch of bitter nuttiness on the finish, a classic Pignoletto characteristic. • Grapes are harvested by hand. Selection of the best rows from 20 year old vines. • Indigenous yeast fermentation, cold soak maceration to maintain aromas. A great blend, Sauvignon giving the minerality, Chardonnay the body and Pignoletto the richness. This blend is elegant and powerful at the same time, with notes of yellow fruit and a wonderful minerality. Sauvignon is the dominant player here, but look for that classic nutty finish from the Pignoletto. • Grapes harvested by hand. Fast maceration on the skins before pressing to maintain aromas. Maceration on the fine lees followed by a blending of the three wines before aging in steel. The wine will eventually spend some time in the bottle before release. Merlot has been planted in Bologna for the last 100 years, if not longer. There are no native red varietals to these hills so this is really the red wine grown throughout the region, together with Cabernet. This is a very expressive version of Merlot that is a testament to the potential of the Colli Bolognesi. Hand harvest, natural fermentation, malo. The wine ages in stainless steel and goes into bottle without being filtered. This wine is a tribute to botanist Antonio Bertoloni’s “Flora Italica”, an encyclopedia of Italian botany, that he wrote while living in the hills overlooking this Barbera vineyard site. The design is a modern representation of Flora, the Roman Goddess of flowers, and conveys a strong feminine wine. That is the idea here for Donatella, achieving the elegant bouquet of Barbera, but also producing a wine that is firm, even a bit savory for this varietal. Heartier than your typical Barbera, think of Bolognese of course! The grapes will be harvested in mid September, fermenting on native yeast with about 20 days of maceration. The wine will then spend 8 months in large oak barrels, older barrels to not overtake the fresher notes of Barbera. 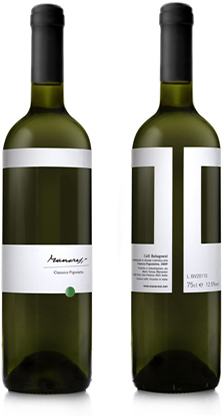 As I mentioned there is a major link to the artist Paolo Manaresi that one feels when visiting the winery so we thought it fit to give you some information on him. 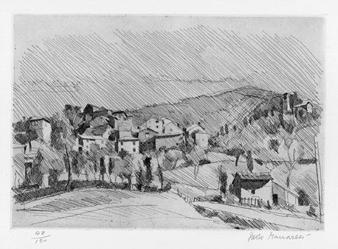 Paolo was born in Bologna in 1908 and possessed notable artistic talent from a young age. During high school he was encouraged to enroll in courses at the famous l’Accademia Della Belle Arti. Already in 1923 he was producing works of art that were strongly influenced by his teacher Giovanni Romagnoli. What stuck out about Manaresi was his ability to create his own personality and style through his work from a very young age. Eventually he became equally known for his sculptures as his paintings. Examples of both can be found in museums all over Bologna, and during his time his works were found all over Italy. He was very influential after the Second World War with many paintings depicting the destruction left behind in Europe. As a sculptor he was often compared to Rembrandt. Manaresi’s crowning achievement may have been his award at the 1944 Biennale in Venice for his sculpture work. Paolo passed in 1991. 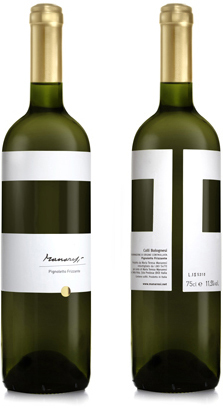 Many of his works line the wine cellar at Manaresi. 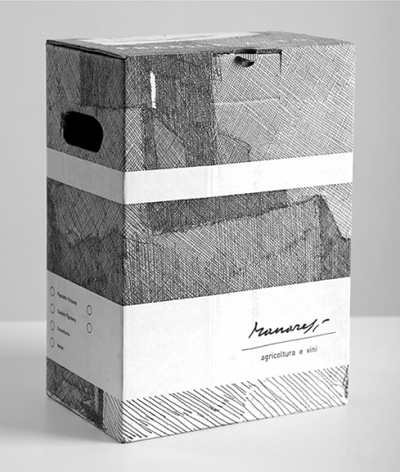 He has influenced the packaging as well with his profile on the bottle of Manaresi’s “Controluce” and his works even on the boxes of the wines that we deliver to you here in Massachusetts!